Amsterdam’s Rise of Realism is the “symphonic rock” brainchild of Andreas van Amerongen. Many band members have come and gone here, but the commitment to a unique musical vision remains, right up to their new album, the eight-song Mirage. Opening with the low synth plodding (and low-sung vocal) “Believe,” with its David Gilmour, Pink Floyd-ian flights, to the big attack of “Mirage” (there’s lots of Bowie’s Berlin period here in the vocal harmony metallic swirl) and the beat-tastic rumble of the very danceable “Only a Handful Are True,” the first of the truly unique songs here, we are in the hands of musicians who know the studio well. The spikes of female vocals behind the lead male grumble work very well indeed. Atmospheric swirling synths grab us first on “Beacon,” then we are into a vocal line following a distorted guitar. This is a big, heavy rock tune based on Middle Eastern modalities and is quite effective (scary too!). “Is It You” has slinky electric guitar and tribal toms in a studied, flangy tune that opens up on the chorus to the harmony vocals, pushing the lyrical theme of questioning of who we are, a subject hit on more than once with the songs on Mirage. Again, we get perfect guitar noodling here and vocals, synths and guitar really make up this outfit. The plodding and big “No Rush” ends. It’s an elegy-like ender to what went before it, leaving us with the overall dreamscape this band imparts with its music. 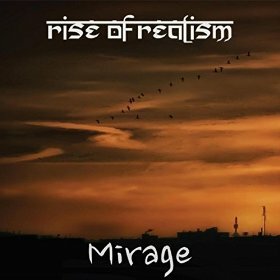 Rise of Realism’s Mirage is like a breath of fresh air from the mid-70’s, and well worth the listen.